John Harper has always been alone. His mother died when he was just seven years old and he was raised in New York by an aunt he barely knew. He never even made his father’s acquaintance – a man who died shortly after he was born. After leaving the Big Apple as soon as he was old enough, his life consisted of one moderately successful book, a collection affectionately received newspaper columns and a comfortable existence in Miami. But then all that changed. One liquor store heist that goes wrong turns John’s existence on its head. It seems that his father didn’t die all those years ago – in fact, he has thrived in the New York underworld. But now the man himself lies critically injured in a Manhattan hospital and it’s time for father and son to meet at last. But this is just the start. For it seems that John’s father was working on something when he got caught in the heist – something very big indeed. And powerful people all over the city want in on it. Shortlisted for the CWA Steel Dagger for Best Thriller 2007! Small-time Miami journalist John Harper gets a call from his aunt. “Come to New York, John,” she says. “No arguments.” And so he goes, to discover that the father he believed had died years before is still alive – barely – and in a coma after being shot trying to prevent an armed robbery. So begins a long, strange trip into a life Harper had no idea existed. He meets a half-crazy cop, an exact mirror image of himself, and the pair form something of a friendship before Harper discovers the truth. Ellory is a powerful talent, and this, his fourth novel, seems set to launch him into the stratosphere of crime writers. This novel is certainly not a standard genre story. It is related in a tough and gritty manner suited to its theme and rolls inexorably towards a classically violent American ending involving several innocent victims. When he moves into dialogue passages the tale soars and flows beautifully. 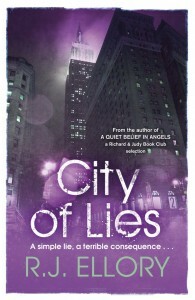 His books have been called brilliant and breathtaking, they have been shortlisted for prizes, and there is no doubt that ‘City of Lies’ carries on in the same vein.